Thousands of us are preparing to leave the rat race behind in favour of open air, canvas roofs and portable BBQ dinners. Wherever you decide to pitch your tent, be it in a state-of-the-art campsite, or half way up a desolate mountain, we are all faced with same the problem of having to “go” at night. The infamous British weather is often the factor which makes this a difficult proposition. Let’s face it, for most of us it’s true to say that our interpretation of “being at one with nature” doesn’t extend to standing or squatting in the dark in a bush full of nettles, getting soaked by pouring rain and simultaneously knocked flat by force ten gusts of wind. The situation is complicated further when you decide to go camping with the kids. When faced with the urge to go at night, the options you are faced with aren’t exactly ideal solutions. Do you run as fast as possible to the toilet block in the hope that your children will not wake whilst you are gone? Needless to say this is not an option that most would consider, especially if there aren’t any other adults in the tent. It’s not a secure solution and it’s guaranteed to have your heart racing…and that’s not from the sprint you just made to the toilet block. Perhaps you could try to find a nearby bush or tree to hide behind that’s out of eyeshot and earshot from your neighbouring campers? Then again this isn’t the most comforting option if it’s raining hard outside, or if you can’t find any nettle-free vegetation in close proximity to your tent. What if your little one is too old for nappies and needs to go at night, but it’s lashing down with rain, and the thought of dragging them outside to either pee in a bush or visit the toilet block will most certainly end in tears…? There is a solution. With Shewee and Peebol, neither you nor your little ones need leave the cosy and secure confines of your tent. Peebol is a compact, disposable and absorbent pouch capable of holding up to 1 litre of liquid. The pouch contains small granules that convert any liquid into an eco-safe gel. The bag can be sealed and reused until it’s full and then disposed of the next morning, safely and hygienically. 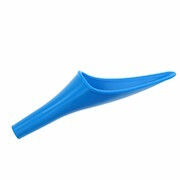 Ladies can easily use a Peebol with the help of Shewee, a plastic funnel which allows you to pee whilst standing or sitting, without removing any clothes. Both are small and compact and will happily fit into your handbag, or rucksack if you intend to go hiking during your short stay away. Don’t be caught short…add Shewee and Peebol to your camping packing list. They could save the waterworks in more ways than one! Festival season is well and truly in full swing. This weekend will see the start of V-Festival, with Leeds and Reading Festivals following a week later. With headlining acts such as Beyonce, Eminem, Kings of Leon, Green Day and The Script, it’s not surprising that tickets have been selling fast. The endless queues, the messy and overflowing toilet bowls and the distinct sun-baked “aroma” are often enough to fill even the most experienced of festival goers with dread. Even if you have mastered the art of “hovering” to avoid coming into contact with the germ-laden toilet seat, you still have to negotiate your way out of the cubicle whilst touching as few surfaces as humanly possible. Peebol is a pocket sized, disposable absorbent pouch capable of holding up to 1 litre of liquid. The absorbent granules inside the pouch convert any liquid into a gel in seconds. Peebols can also be used for the dreaded festival number 2. The pouches are se alable, making them spill-proof and odour-free. If the ladies out there are wondering how on earth to pee into a pouch without getting very messy or having to find somewhere private to undress, then take a look at Shewee, a urinating device that enables women to have a pee standing up, without having to remove any clothes. Coupled with a Peebol pack, Shewee will allow women to “go” wherever and whenever, still with dignity intact! Shewee and Peebol are priceless for those of you who are planning to camp at night. You no longer have to stumble around in the dark trying to find the toilets (just follow your nose), and then having to relocate your tent amongst the sea of canvas. Instead, you can stay in the warm and private confines of your tent, safe in the knowledge that you are maintaining at least a basic level of hygiene. Don’t let the festival toilet be the bane of your weekend. ..add Shewee and Peebol onto your festival checklist. You won’t regret it!!! !